In May/June 2018, we made another buying trip to the UK. Much nicer weather versus our trip last Nov/Dec. We visited friends that sell to the trade and made some new ones. We are very happy with what we found and you can find them on Our Lastest Finds page. They are still being packed in a 40-foot container for the Fall Show at the Compound in Round Top. If you have any questions about any of the items, just let us know. The following is a list of the shows or events where we will be displaying. We will keep updating this page as we add shows, so check back often to see if we will be at a show near you or one you plan to travel to see. We will put all the information we have in terms of dates, booth location and any information we may have about the show. To the right, we have provided some links you may find useful or interesting. This show continues to be one of the most discussed shows in the country. People from coast-to-coast come to experience this event. Of course, finding a place to stay and eat is no minor feat. It's a town of 77 people that is the hub for a series of fields stretching over about 12 miles. At its peak, it can easily grow to 200,000+ people, so expect lines, congestion, but lots of fun. 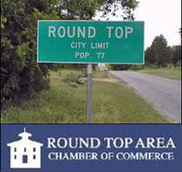 We have several links for this show, one to the Round Top Area Chamber of Commerce for schedules, lodging, places to eat, etc. ; and one to our venue - The Compound - so you can learn more. This fall will be our eighth show (4 years) at the Compound. And, we will be in the same spot in the Peck Barn, which is pictured to the right. The facility is great and we enjoy it very much. We went to the UK again this past May/June to buy especially for this show. More and more people are telling us that we have the most unique items from the UK, a quality selection of pine furnature and reasonable prices. We like that feedback. The best part is the Barn is air conditioned. To find The Compound -- it is just south of Marburger - on the same side of the road. ALSO - WE HAVE SOME MORE NEWS - WE WILL HAVE ANOTHER BOOTH IN THE PECK BARN. ALSO. WE ARE ADDING SOME GARDEN ITEMS WE FOUND IN THE U. K.